Kimcheelicious contributor J. Lujan has a great low-calorie solution for his Bay Area produce using his pack of Hanguk Saffron: A deconstructed chap chae dish and spicy kale chips made with my powdered kimchee seasoning. I want to point out that J. Lujan has roots in Guam, but is not native born, which proves my theory that our passion for eating well is more nature than nurture. Make these low-cal meals with less carbon miles. Chap chae is a popular Korean noodle dish made with mung bean or sweet potato noodles flavored with soy sauce, miso, sesame seeds and garlic. Here’s a vegetarian twist on a traditional Asian noodle dish. 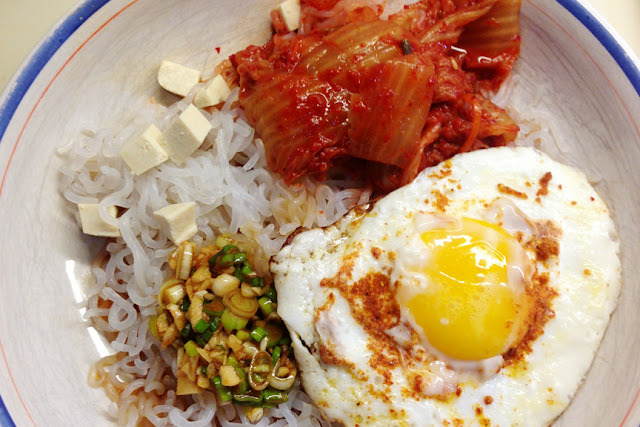 The only thing that can make it better is a fried egg and more kimchee. Instead of using a traditional noodle, I use [these] zero-calorie noodles for a delicious, filling and low calorie meal (source: http://www.nooodle.com). I mix a some minced garlic, diced green onions (scallions) with some soy sauce and a little bit of sesame oil. This makes the sauce. I pour this sauce over the prepared noodle, added some of your delicious kimchee, a little diced tofu, and a fried egg. Sprinkle some of the Hanguk Saffron and mix. It’s yummy, you've got try it. Are you still waiting for something good to pop out of your food dehydrator? 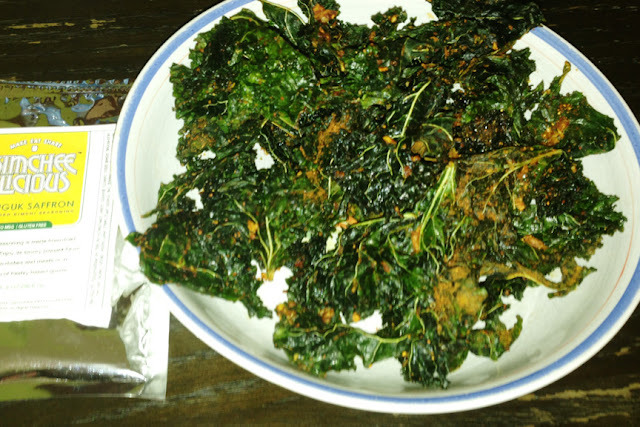 Make your own kale chips. Follow these easy instructions to make a healthy crispy treat. It’s all that and a bag of chips. Dice and save those kale stems along with leftover bit of mustard greens in the freezer for your next batch of collards. Freezing brings the sugar to the surface and helps to break down the fiber.